After a weekend of family and friends, and now standing here among you, I would like say how grateful I am. I am grateful to those of my family who came before me, who taught me what they knew, who showed me through their words and actions what they valued. I am grateful to those who walk beside me through this crazy and wonderful world, and who join to celebrate those values, as old-fashioned as they may seem these days. I am grateful to my children, nieces, nephews, and cousins, who carry forth in faith with their spouses and children. And I am especially grateful to share this space, and our community here at St. John’s with all of you. I am grateful for your friendship, for your faith in St. John’s, and for your commitment to our continued life here together. As you may know, my family uses DiMauro Hall for our Thanksgiving dinner. So I have had occasion over the last four or five days to be here a lot, both setting up, and then putting everything away afterward. I had an amazing time noting all of the contributions of those who keep St. John’s going week by week, year by year. I met Josh, our new parish administrator, who has done a great job organizing closets and shelves in the office, I worked to the tunes of the organ being practiced. I watched the gourds from the harvest change to the white linens of Christ the King Sunday. Hangings on the walls and jewel-toned windows colored the sanctuary. I walked by the Memorial Garden, thinking of those who designed and built it, and those who lie there. I found the potted plants the kids made in Sunday School, and remembered Mimi painting the Loring Room. I looked over the faces of our past rectors, and remembered those who donated the couches we enjoy during Book Group. Mark dropped in and helped us move tables. 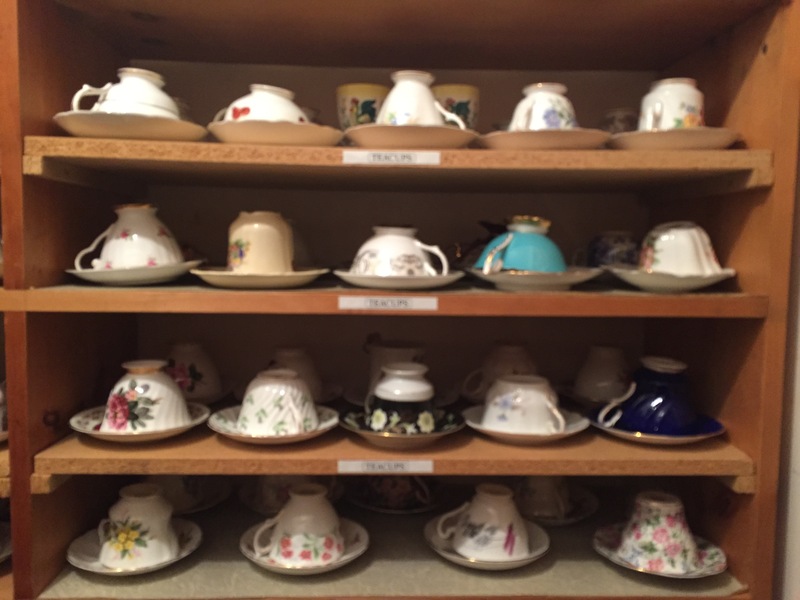 I straightened the teacups donated by so many of our past families to indicate their membership at St. John’s, and noted the newly cleaned couch in the upstairs restroom. I loved the heat that worked, the hot water heater that let me finish the dishes, noted the snow markers along the sidewalk and shovels inside the doors, and the new steps up to the playground. I swept the gorgeous new floors of DiMauro Hall, and found some new papers to add to the archives in the old counting room. The new windows lit the downstairs with afternoon light, and I remembered the work of the “new” kitchen after the flood years ago as I put away the dishes, two sets of china donated decades ago by parishioners I never met. Moises, our cleaning man came twice and vacuumed and mopped everything so it would be perfect for today. I sorted the collection of coffee cups, and remembered whose interests were represented by their decorated sides. As I cleaned the rest of Thanksgiving from the fridge, I saw the remainders of our summer grilling Sundays. I saw that Red Fire Farm’s crates and signs had all been packed up ready to be picked up. The red chairs glided across the newly shined floors without scratching. Music is sorted in the choir room. Photos of our parish life decorate the halls. As I carried our things out, the gardens were all put to bed, sleeping and waiting for the glorious blooms of spring. Everywhere I looked I saw the work of so many that I know, and many that I never met, but whose hands made a difference for our community here. I thought a lot about the lessons as I straightened, wiped, sorted and cleaned. Today’s lessons are about the kingship of Jesus. Christ the King. A glorious title, yet a feast day borne in the hopelessness of World War I. I preached on this very text three years ago, and since 2015, our worldly examples of leadership are almost more crazy than those that used nationalism to lead us to join in the carnage of 1914 – 1919. Leaders who accrue to themselves self-importance, wealth, and more power, and bestow to those they lead, fear, division and militarism. I naively thought we had seen the end of this strong-man model in the 80s. In our lesson today, we have Pilate, one such leader. He understands the world he lives and works in. He must demonstrate strength and control. Jesus understands Pilate’s world, and he makes the point that he has a completely different perspective on leadership. In Pilate’s world, might makes right. Jesus has a whole different take on leadership, one that Pilate can’t grasp. Our culture often measures leadership success by what a leader gets, not what they give. For Jesus, strong leadership means service to others. This leadership was surprisingly presented to me in a new way as I stepped into a conversation before dinner on Thanksgiving Day. A close friend of mine was asking my son about his new job. Jack just got a position managing eleven people – his sales team at Toast – and he has been doing a lot of reading on the topic of leadership. Extreme Ownership is one book he mentioned. Written by a former Navy Seal, it teaches that it is not CEOs leading robots that follow orders who create a successful business, but leaders who allow their team of individuals to create their own plans, get the satisfaction of seeing a plan through, and celebrating with them. It means coaching rather than telling. It means having their backs when things start to go wrong instead of assessing blame. It means helping them to create a solution. It means delegating authority instead of just responsibility. Another recent leadership book is Radical Candor by a woman who worked for Microsoft. Her idea is that a good leader directly challenges their team personnel, while at the same time, showing that they care personally for their members. A good leader can’t care so much that they are never honest with someone about places that they need to grow, and they also can’t give difficult feedback in an environment where the person doesn’t feel valued or known. Jack explained his takeaways to us. Each member of my team is super talented, he said, and brings many gifts to the table. My job is actually to be the strongest supporter of my teammates. I help my team to set goals and meet them. When someone has a tough day, it’s my job to pick them up; when someone misunderstands, I have to help them understand, or find someone else who can explain something more clearly than I can. I make sure to keep everyone loose and relaxed. I celebrate when they have a success. I have to be the one to accept responsibility if something goes wrong. For me, these takeaways relate to the kingship style of Jesus. The leader speaks the truth in love, challenging all to do their best, and then provides the support needed to keep the team spirit high; they build community among their teammates. The good leader gives authority to his team to create their plans and execute them. When, inevitably, someone on the team fails, the leader bears the blame. Jesus shows us a kingdom where the truth is primary. He provides us with the support of the Holy Spirit who builds community to help us support each other. He gives us the authority in our baptism and confirmation to carry out His work. He challenges us to set goals and to meet them. When we fail, He accepts ultimate responsibility and forgives us. Now, you all know that we have a job to do here at St. John’s. Like everywhere else in the entire world, our little haven here in Newtonville is facing change. People hate change, we all want to feel safe somewhere, we want something to be a constant. Well, folks, the good news is that nothing is changing. Jesus is the constant. Through His example of leadership, we have been given the authority to act through our baptisms, with the help of his Word and Spirit to guide us. We have the authority to move forward together. We do get to create the plans. We do get to execute them together. We are one team, all heading toward the same goal, and there are many things to do and many ways to contribute. I thank God for each and every one of us on the St. John’s team. I give thanks for each of the many gifts we bring. As Hymn 289 just reminded us, we are part of a team that has worked for 120 years to build our church and keep it strong, to teach our children, to care for our elders, and to love each other through our happiest and saddest days. What we do here at St. John’s, from cleaning closets to polishing brass, to planning potlucks and cleaning gutters, builds upon our belief that good leaders take as their example Jesus’ kingdom, and together we keep it blooming with colorful life on our little corner of Otis and Lowell. We praise Thy name today. Our harvest may be garnered by ages yet unknown. Our Father, make us faithful to serve the coming days.